Inmotion has defined the new way of hosting websites that attract more traffic from the search engines and help the owners to make more money. It is now necessary for every business to have an online presence for more people to know about the products and services offered. Having your website hosted by a reputable web hosting company like Inmotion gives internet users and your audience an opportunity to discover new things about you and your business. Enterprise Web Hosting is one of the hosting packages offered by Inmotion. It comes with unlimited domain hosting, unlimited bandwidth, spam prevention measures, unlimited MySQL databases, Unlimited FTP accounts, dedicated IP address, daily remote backups, unlimited subdomain hosting and many other resources to ensure that your websites are running correctly. Though your websites will be sharing the server with several other clients, Inmotion does not overload the servers to profit itself. The most important thing is the satisfaction of customers. The price of Enterprise Web Hosting 2.0 is $14.97 per month if making payments every month. However, the best thing is to go for the triennial plan where the monthly cost is just $9.97, giving you savings of $5 every month. That is the plan that most people go for. A good thing about the plan is that you will be given a free domain name with the 3-year plan. That is another value of $10 for you. Inmotion also has annual and biennial payment’s plans which also come with free domains for you. Inmotion also provides a reseller hosting plan, which gives you the opportunity to have your hosting company and start making money. 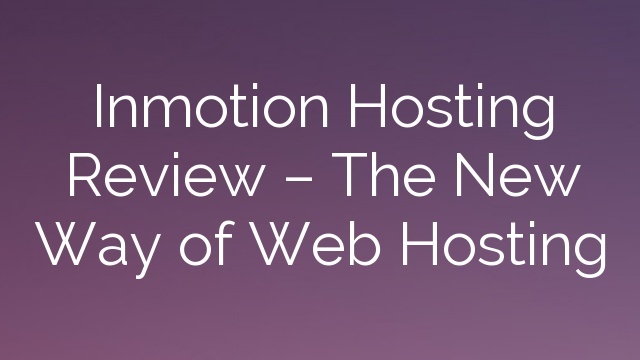 Several reviews praise Inmotion, including https://www.hostingmanual.net/inmotion-review/. This hosting provides you with the security, management tools, and flexibility to sell web hosting packages to others who need to host their websites. You are free to set the pricing, packages, and features of the plans to be resold. The plan also comes with WebHost Manager (WHM) through which your Reseller accounts can be managed through a single web-based panel. If you don’t want to run a web hosting company, the reseller account can also be used to manage multiple sites. There are many people with hundreds of websites in various niches. A shared hosting does not have the resources, bandwidth and disk space for such a number; therefore, the best way to go is through the reseller hosting. The reseller hosting from Inmotion is the cheapest in the industry if you consider the cool features provided. The price ranges from $22.95 to $147 a month depending on the disk space and bandwidth. However, all packages come with the ability to host unlimited domains, subdomains, MySQL databases, email accounts, FTP accounts and private nameservers. Inmotion has a Virtual Private Servers (VPS) hosting plan for those who need maximum VPS processing power, disk space and memory. Inmotion has the primary goal of building virtual private servers which deliver maximum performance for every dollar you pay. VPS hosting gives you the experience of a dedicated hosting paying for a shared hosting. That is a great thing for those who cannot pay for a dedicated hosting. The cost of using VPS ranges from $19.95 to $79.95 every month depending on the processors, memory, disk space and transfer. Most people buy the Xen12288 plan of $79.95 per month because it comes with a disk space of 320 GB and 12 GB memory. This is a great thing for those managing multiple websites and specialized applications. If you want more for less, the Inmotion dedicated server hosting is the best for you. A dedicated server makes you operate in your world and in your way. This means that you are given a dedicated server – it will not be shared with other clients; there will be no server breakdown due to overload; you are free to have as many sites hosted as you want, and you will operate with your unique DNS. The price of Inmotion dedicated server ranges from $297 to $597 depending on the processor. For the $297 per month hosting, the company has single processor servers, and you can select from 4 to 8 cores, while you have a RAM of up to 64GB. Inmotion also provides multiple processor servers from those paying $397 and $597 per month. You can select from 16 to 32 cores with RAM of up to 128GB. Inmotion should be your choice if you are looking for a good web hosting company. You will be given attention by a team of RHCSA Certified System Administrators available round-the-clock. You will never be kept waiting on the line because you will be attended to within 15 minutes initiating a chat session. Inmotion counts on a high-speed Internet connection and space for your website and applications to have access to the web. The web hosting company has backbone connectivity with an exclusive use of Cisco for different routing/switching solutions. The facility of Inmotion makes use of multi-gigabit connectivity to the backbone providers such as Level3, Savvis, Global Crossing and Cogent. Inmotion works with multiple backbone providers and redundant 22-ton Liebert HVAC systems to ensure a reputable and stable network and power infrastructure. To prevent any loss of your data, the company has diesel-powered generators and full UPS backup systems. Therefore, the Data Center makes your websites to be running 24/7/365 without interruption.